31P MR spectroscopic imaging (31P MRSI) in vivo suffers from low spatial resolution and long measurement times. The purpose of this study was to prove feasibility of a three-dimensional 31P radial Echo-Planar Spectroscopic Imaging sequence (3D radial EPSI) for 31P MRSI in vivo at 7T. 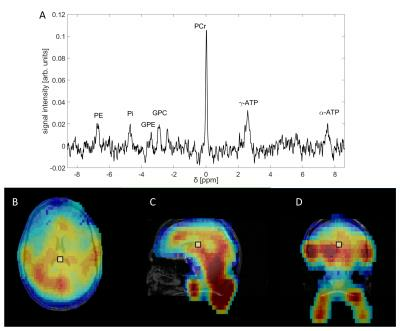 The presented data with an isotropic spatial resolution of (10mm)3 in the human calf muscle and (18mm)3 in the human brain show well-resolved loaclized spectra proving feasibility of the 3D 31P radial EPSI sequence with measurement times of about 35min at 7T. MRSI can benefit greatly from ultra-high field strengths. Given the higher SNR and higher chemical shift dispersion, metabolite mapping can be done with higher quantification precision and at higher spatial resolution. The aim of this work was to study the competing effects of spatial resolution, SNR, linewidth and higher field strengths by pushing the spatial resolution limits of 3T and 9.4T for metabolite mapping of the human brain. 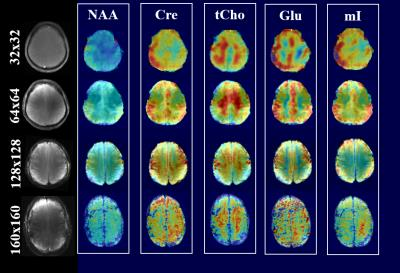 In this work, we present a new imaging capability for simultaneous mapping of metabolites, macromolecules and tissue susceptibility in the brain, using a single scan for about 5 minutes. This new capability builds on the recently proposed subspace imaging framework SPICE (SPectroscopic Imaging by exploiting spatiospectral CorrElation) and uses a union-of-subspaces based approach to extract tissue susceptibility, metabolite and macromolecule spatiospectral distributions from an ultrashort-TE, short-TR, high-resolution MRSI scan without water suppression. In vivo results were used to demonstrate this exciting capability. The purpose of this study is to use a metabolite cycling scheme combined with FID MRSI, acquire and compare spectra and metabolite maps from both water suppressed and non-water suppressed FID MRSI at 9.4T and 3T. In this work three different acceleration methods, 2D-CAIPIRINHA with phase-encoding, spiral encoding and concentric circles (CONCEPT) for brain MRSI at 7T were compared. The metabolic maps were compared qualitatively, and the CRLB and SNR values were compared quantitatively. The metabolic maps of 2D-CAIPIRINHA with phase-encoding provided the best data with respect to metabolic maps, CRLB and SNR values. Improving the PSF by increasing the matrix size from 48x48 to 64x64 enhanced the data quality again for CONCEPT. Spiral and CONCEPT encoding are prone to spectral baseline distortions. 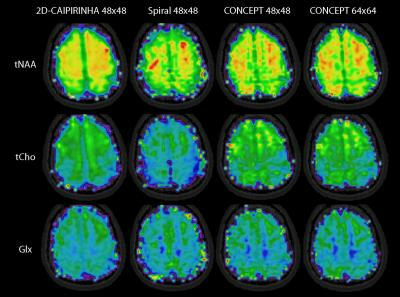 Nevertheless, CONCEPT has a high potential for high resolution brain MRSI at 7T. ASPIRES is a novel method for accelerated, high-resolution, large-bandwidth echo-planar spectroscopic imaging. It uses readout segmentation to decouple the echo spacing from the spatial resolution and gradient-system performance. Readout segmentation is combined with blipped phase encoding to accelerate scans by random undersampling along the readout-segment, phase-encoding and time directions. 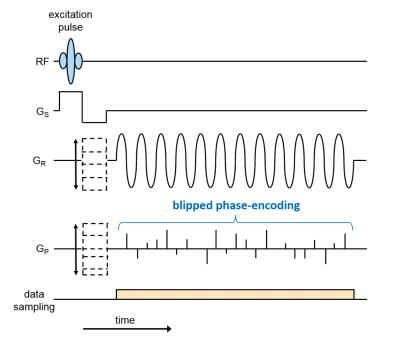 An elliptical acquisition window in the readout-phase encoding plane reduces scan time further. Distributed-multisensory compressed sensing reconstruction efficiently restores signal properties in both spatial and frequency domains. ASPIRES promises to enhance the diagnostic performance of MR spectroscopic imaging in clinical routine and improve the study of metabolites at high field strengths. In vivo MRSI at 7T offers advantages compared to lower field strengths, in particular higher SNR and improved spectral resolution. However, spectral quality is often limited by strong B1+ inhomogeneities, motion-related artifacts and scanner instability related B0 field drifts. To overcome these limitations, we have developed a 1D-semiLASER 2D-spiral-encoded MRSI sequence with real-time motion monitoring/correction using 3D EPI-based navigators (vNavs). Besides sequence stability we show that accurate B1-insensitive excitation can be achieved throughout the slice until the border of the brain. Using 7T-optimized motion correction, high spectral and metabolic map qualities are feasible even in the presence of motion. 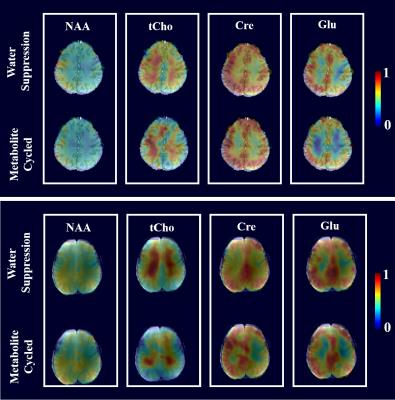 To overcome box-shaped ROIs and enable brain-structure-specific comparison of metabolite levels across patient groups, a fully-automated brain-structure-specific metabolite quantification approach was developed and applied to the analysis of MEGA-LASER 3D MRSI data. Structure-specific GABA, Glx, NAA and tCho levels and their hemispheric variation in healthy volunteers was studied. The four metabolite levels varied significantly across different brain regions, but did not differ between left and right hemispheres. Correlations between the left and right hemisphere metabolite levels were observed only for some structures. 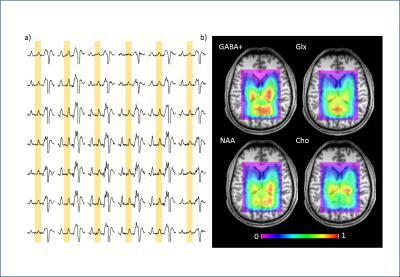 Magnetic resonance spectroscopy (MRS) benefits from increased magnetic field-strength in terms of increased sensitivity and spectral separation and human cerebral concentrations of neurotransmitters have been measured with improved precision at 7T. We utilize the high sensitivity at 7T for accelerated magnetic resonance spectroscopic imaging (MRSI) of the gamma-aminobutyric acid (GABA) inhibitory neurotransmitter in the human brain at 7T using spectral editing (MEGA) and a semi-localized by adiabatic selective refocusing (sLASER) with echo-planar readout (EPSI). 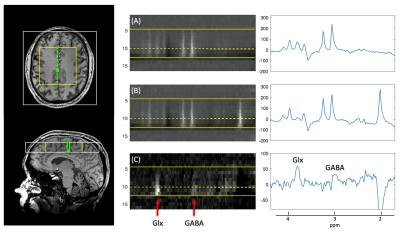 The proposed method is shown to allow for localized GABA detection and demonstrate potential for efficient imaging of GABA. A full phase correction at high resolution is incorporated into the overdiscrete reconstruction for 1H MR Spectroscopic Imaging (MRSI). This allows to correct spectral artifacts generated by phase disturbances and increase SNR in one step, hence improving metabolite detection for fast MRSI acquisitions at short echo times. The phase correction term is approximated as a piecewise polynomial, fitted from a water reference scan that is acquired simultaneously with the metabolite signal. The method was applied to standard phase encoded MRSI and Echo-Planar Spectroscopic Imaging (EPSI) brain scans showing comparable improvements.